So as the final strains of 2016 sweep the globe and 2017 looms large on the horizon, Getintothis’ Mike Stanton steps back to survey the fallout with his Unknown Pleasures end of term round-up. 2016 is almost out and as we all shudder in anticipation at what 2017 has in store for us it’s time for me to wrap things up for Unknown Pleasures this year. I took over from Patrick Clarke in July of this year and have discovered some very cool sounds and ace bands/artists in the months since. 24 editions in and I’m still finding new and exciting tunes to share with you. I have scoured the world for tunes of finery and quality to amaze you with. Starting on July 7th I think I have featured 72 tracks from bands spanning the globe from the US, Australia, Russia, various parts of Europe, India, Africa and beyond. So here’s a playlist of the highlights for me and I have included a half dozen or so from when Patrick was running this column, tracks that stood out for me and are worthy of inclusion. Blackpool’s Phono Ghosts is producer and sound collagist Neil Scrivin. Showcasing his intricate cut-and-sample techniques, it is a triumph of glitch-edged production and inventiveness evoking experimental artists such as VHS Head, Jacob 2-2 and 80’s sample legends The Art of Noise. With Tsunami at White Hotel, analogue distortion, tape warp and ragged phasing are evident and drive the track into strange and exciting vistas. Record label Skam has persistently put itself at the forefront of experimental electronic composition and Phono Ghosts is a fine purveyor of this. Glitchy, propulsive with an electro-funk quality, Tsunami at White Hotel stabs and judders its way forward sounding, at times, like a trapped cassette wrapping itself around stuttering tape heads. His album Solar Dream Reel is a brilliant collection of sweeping melodies sharply punctuated by Scrivin‘s arresting percussion, gleaned from what must be, at times, a chaotic creative process and auditory birth. Salt Rush is a collaboration between Mark Peters bassist/guitarist/keyboardist in electronic shoegaze band Engineers, composer/producer and Engineers drummer Matthew Linley and Maud Waret who provides vocals. Judging by the pedigree of those involved, this project delivers exactly what you would expect and hope. Cascades is a dreamy, hazy and shimmery song. Waret’s vocals are gossamer-infused, floating on an ethereal plain of washed guitars and warm synths. The melodies glitter as if captured in flecks of light cascading in a waterfall. Right from the off the track drifts gently into a diaphanous realm of the pastoral ambience reminiscent of Ulrich Schnauss‘ synth-gaze releases. Expansive soundscapes and breathy keyboards are underpinned by reverb-soaked guitar creating a meditative cosmic lull. It is achingly beautiful and deeply immersive. The full sheen of Waret’s vocals swirl slowly, spinning in and out of the ambient realm created by Peters’ and Linley’s astral production. Former Hooray For Earth frontman Noel Heroux and his wife Jessica Zambri form Mass Gothic and they have woven something that is at once positive, euphoric, shimmering, hazy and anthemic. A Run is a stunning track, it has enough power and scope to completely overwhelm the senses. Mass Gothic already have an album behind them, releasing their debut self-titled LP back in February and are now teasing their latest EP with this release. Using the reverb-soaked shimmer of shoegaze and subterranean-textured electronics they have moved beyond songwriting into soundscaping territory. If you have ever wondered what it is like to be caught in a snowstorm of swirling, crackling and warping sound, well you have your answer; glorious. Plike is the solo project of Em Baker aka Mad Madam Em, an electronic music producer/composer from Austin Texas. Her sound is hauntingly beautiful, dark and twisting. She uses organic and synthetic sounds to create a collage of discordant and melodic shapes that shift and evolve through the fogged-out and immersive forest of her electronic compositions. The Proving Grounds is the lead single from her album Red Queen, White Queen and it is a dramatic and windswept track that conjures images of darkening moors and fractured skies. Dark, sullen and seductive it opens with the clarion call of a siren and we are instantly transported into the world of fleeting shadows, of slow-breathing beats, multifaceted production, lush and enveloping keyboards and melodies that intertwine and mingle throughout the cavernous-deep atmospherics. Em’s voice is haunting and plaintive, sounding like Thomas Edison’s fabled spirit machine has caught the essence of Kate Bush and beamed her through a spectral projector. It is multi-layered and sensuous. This is dream-infused gothic that is intoxicating and utterly bewitching. Rykard is a producer of ambient electronica from beneath the elephant-grey skies of Lancashire. His debut album Arrive the Radio Beacon in 2010 caused ripples across the globe with his blend of ambient atmospheric bliss. Comparisons with Boards of Canada are inevitable. However, he has forged his own sound. Ictis, the first teaser for his new album, Luminosity, is as wide and expansive as the County he hails from. Opening with a hint of 808 State’s Pacific State, Ictis emerges into slow-chilled trip-hop beats, dub bass and shimmering synths that mingle to produce trance-like melodies. This dark-edged, introspective and contemplative mood allows the listener to create their own journey. Ictis is a stunning arrangement of atmospheric electronica dabbling in delicate melodies and dimensional flurries. Introflirt featured in my fourth column (July 28th #92) and I reviewed their track Orange Light. 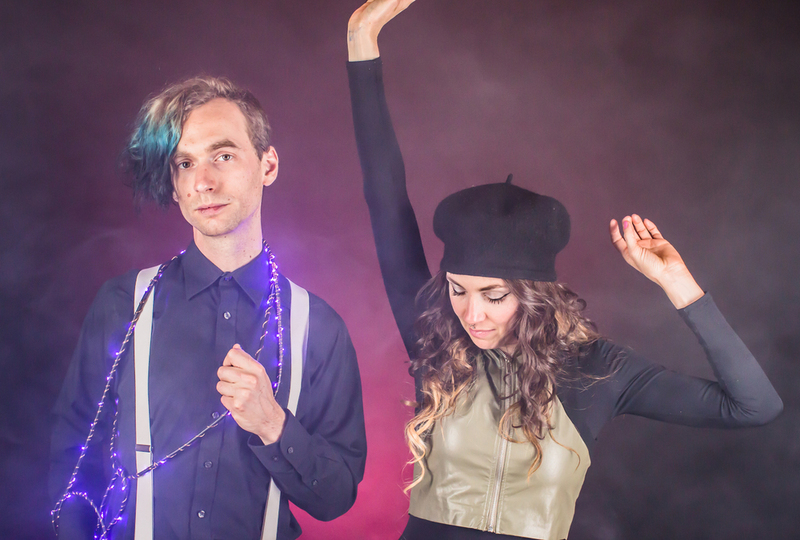 I knew Ben Runnels (Ben Benjamin) the lead singer who with keyboardist Nicole Renae (Denalda/Vafa) created 1980’s inspired, dark, neon-lit new wave. Their songs were full of noir-specked melodies and Ben’s shadowy croon to create what they dubbed croon-wave. Both Ben and Nicole were lost in the Ghost Ship Oakland California fire that claimed 36 lives at the beginning of December. Ben was known in the Oakland area for playing in jazz bars interpreting old classics with his distinctive voice and easy charm. This translated to his band Introflirt by combining Denalda‘s ice-cool new wave synths with Ben‘s 1940’s style delivery. I found Ben to be a kind and gentle soul who encouraged other musicians and performers. Friends fondly spoke of Ben‘s love for film noir, old jazz, vintage clothing and coffee, and remembered that underneath it all was a kind-hearted and quick-witted soul. Here they are doing what they loved. So, it is with a hint of sadness that I sign off this year and look forward (tempered with some trepidation) to what 2017 has in store. Here’s a playlist of the highlights of this year. See you all on the flipside.